Ok ok, so by now if you want a place to watch the Games, you have options. If you weren’t lucky enough to get the tickets you wanted (neither were we), you could always trot along to a park and watch it with thousands of others or, failing that, just watch it on your own telly. It’s true. 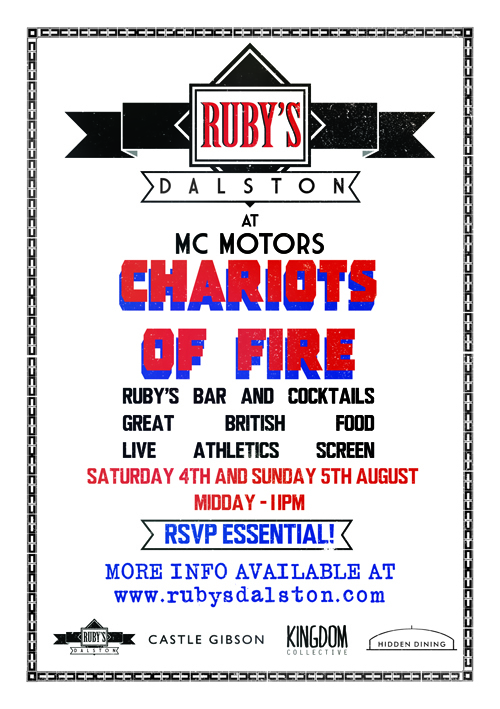 But what if there was something a bit different..
From the people at Dalston’s premium underground drinking den Ruby’s comes Chariots of Fire – the Olympic screening event you might just have been waiting for… Over the weekend of Saturday 4th and Sunday 5th August, Ruby’s decamp to the Castle Gibson-owned MC Motors next door – a charming backstreet warehouse space decked out with oversized chesterfield sofas, theatre lights and retro stylings to boot. Causing a stir in certain corners for their selection of local and world beers plus game-changing concoctions like the ‘Blackberry Mojito’ and the ‘Chili Apple Martini’, Ruby’s move to their bigger neighbours’ for a two-day residency, featuring all the action from the weekend’s games – including the 100m final – live on the big screen, hand-picked selection by DJ Miles Hartley and food by local guerilla gastronomes Hidden Dining. There’ll also be some topical additions to the ever-evolving menu including the ‘Going for Gold (Tequila) and Watermelon’. 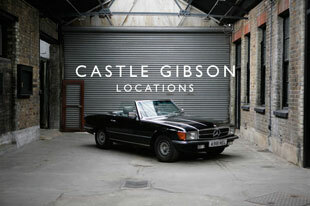 At the forefront of East London’s burgeoning dining scene and under various guises Hidden Dining founder Claire Roberson has been providing relaxed informal dining in thought-provoking East London spaces and locations for the past five years. For Chariots of Fire, they’ll be setting up a 40-seater restaurant for the weekend, offering guests either home-made bar snacks or some sit-down traditional British Cuisine. Plus, the rustic MC Motors has played host to numerous Olympic photo shoots over the past few months, a selection will be on show over the weekend including current stars Jessica Ennis and Phillips Idowu as well as former greats Linford Christie and Kriss Akabusi. 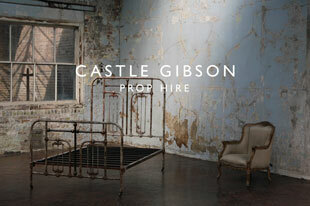 RSVP to rubys@castlegibson.com or attend the facebook event to confirm entry.